When it comes to carbonyl chemistry, if you have to know one reaction mechanism – and only one – it should be the 1,2 addition, hands down. The carbonyl carbon is an electrophile, and it reacts with nucleophiles to produce a tetrahedral species. It’s the fundamental reaction of carbonyl chemistry. 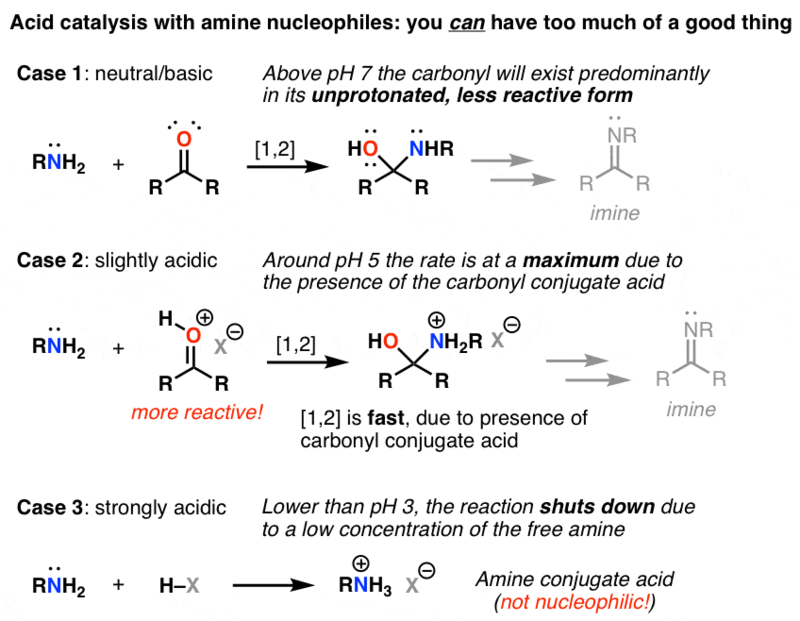 Now, if you want to make a carbonyl even HUNGRIER for nucleophiles, you can add an acid to it. This increases the population of the more electrophilic resonance state on the right, which has a higher rate of reaction with nucleophiles. Let’s compare them side by side. Note that by adding acid this has become a 3 step mechanism: protonation,1,2 addition, and deprotonation. 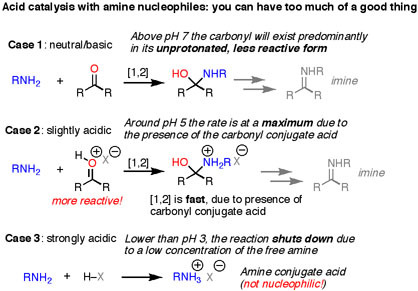 The extra reactivity afforded by the addition of acid comes with a complication: the nucleophile is also a base, and one must choose the strength of the acid carefully to make sure that there isn’t an irreversible reaction between the nucleophile and the acid which would shut down the reaction. For instance, the rate of reaction of amines with carbonyls is very dependent on pH. As one goes from pH 7 to pH 5, the reaction rate increases, which reflects the greater reactivity of the carbonyl conjugate acid. Around pH 5 is the Goldilocks point: acidic enough to increase the rate of reaction, but not too acidic. Lower than pH 5, the reaction rate starts to go down, which reflects the greater proportion of the conjugate acid of the amine [we call this an “ammonium salt”] which is not nucleophilic. Lower than pH 3, the reaction completely shuts down since all the free amine has been converted to the ammonium salt. This is mostly of concern with amines and related neutral nucleophiles, in the formation of imines for example. The pKa of primary amines are around 10 or so, while the pKa of protonated alcohols are about -2 (compare to -7 for HCl). Irreversible protonation isn’t really a concern with alcohols – you can crank on those reactions with strong acids without too much worry.